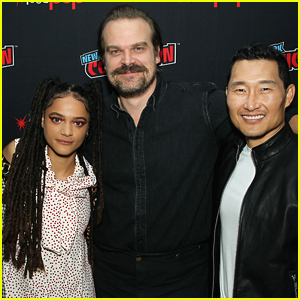 Sasha Lane, David Harbour and Daniel Dae Kim Promote 'Hellboy' at NY Comic-Con 2018! David Harbour buddies up to co-stars Sasha Lane and Daniel Dae Kim at the 2018 New York Comic-Con on Saturday afternoon (October 6) in New York City. The stars stopped by the event to promote their highly anticipated new movie Hellboy alongside the comic’s creator Mike Mignola. During their panel discussion, David opened up about taking over the lead role from Ron Perlman – who played Hellboy in the 2004 version of the film. FYI: Sasha is wearing Adeam boots. 'The Walking Dead' Premieres New Season 7 Clip Filled with Spoilers at Comic Con - WATCH NOW! SPOILER ALERT! Don’t continue reading if you’re not caught up with last season of The Walking Dead! 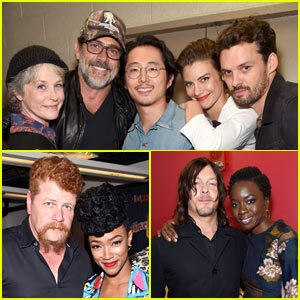 The Walking Dead cast pose for pictures before they hit the stage at New York Comic Con on Saturday (October 8) in New York City. Cast members on the panel included Melissa McBride, Lauren Cohan, Steven Yeun, Austin Nichols, Jeffrey Dean Morgan, Norman Reedus, Scott Gimple, Lennie James, Sonequa Martin, Greg Nicotero,Robert Kirkman, Michael Cudlitz, and Danai Gurira were all involved in a discussion about the upcoming season 7 with moderator Chris Hardwick. During the panel, the cast released a new clip for the upcoming season 7 of The Walking Dead! 'Iron Fist' Gets First Offical Teaser Trailer & Sigourney Weaver Joins 'Defenders'! The first official teaser trailer for Marvel’s Iron Fist debuted today during 2016 New York Comic-Con! 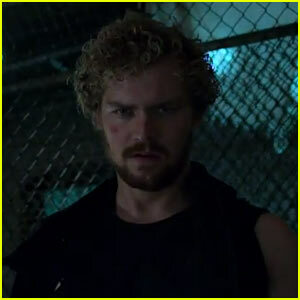 In it, Finn Jones takes on the role of Danny Rand, showing off the power of the Iron Fist as he trains to be the ultimate fighting weapon. The cast also includes Jessica Henwick, who plays Colleen Wing, and Lewis Tan, who plays Zhou Cheng. Iron Fist is the fourth live-action series from Marvel, following Daredevil, Jessica Jones and Luke Cage, which are currently streaming on Netflix. All four series will lead up to the main characters teaming up in Marvel’s The Defenders. At the Comic-Con panel, Sigourney Weaver made a surprise appearance and announced that she will be joining The Defenders cast as well! Marvel teased that she will have a big role, though no further details have revealed at this point. Catch Iron First when it premieres on Netflix on March 17, 2017, and watch the trailer below! The official teaser trailer for John Wick: Chapter 2 was released today during 2016 New York Comic-Con! 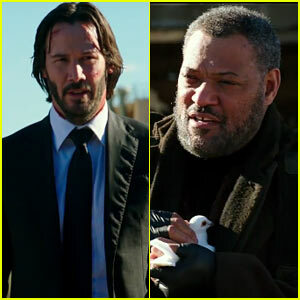 The trailer brings two of the main characters from The Matrix together – Keanu Reeves, who played Neo in the triology, and Laurence Fishburne, who played Morpheus. In the upcoming film, Keanu will reprise his role as John Wick, and Laurence will take on the role of The Bowler King. Hip-hop artist Common, who will be joining the cast for the second film as well, is also featured in the new trailer. Check it out below, and catch John Wick: Chapter Two when it hits theaters on February 10, 2017! 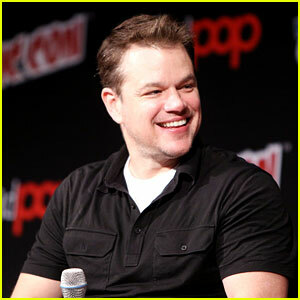 Matt Damon is all smiles while appearing on a panel for his movie The Great Wall during 2016 New York Comic-Con on Saturday afternoon (October 8) at Madison Square Garden in New York City. 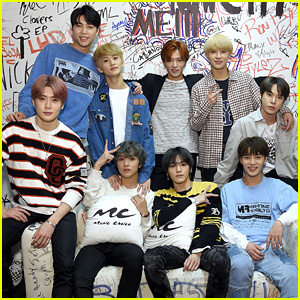 The actor celebrated his 46th birthday at the event and he was joined by co-stars Pedro Pascal, Jing Tian, Junkai Wang. During the panel, Matt got a birthday text message from his dad and he read it aloud to the audience. Milla Jovovich and Ali Larter walk the carpet while attending a panel for Resident Evil: The Final Chapter at 2016 New York Comic-Con on Friday (October 7) at Madison Square Garden in New York City. The ladies were joined at the event by co-stars William Levy and Eoin Macken, as well as director Paul W.S. Anderson. 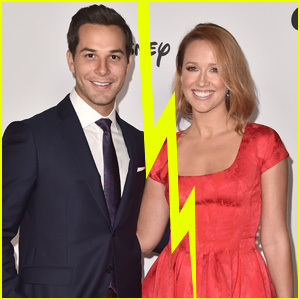 If you didn’t know, Paul also happens to be Milla‘s husband! 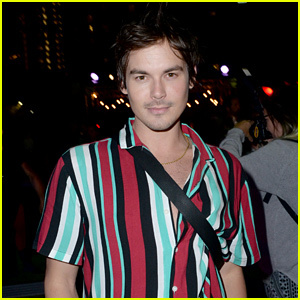 A new trailer for the upcoming film was released at the event and you can watch it below. Resident Evil: The Final Chapter will hit theaters on January 27. 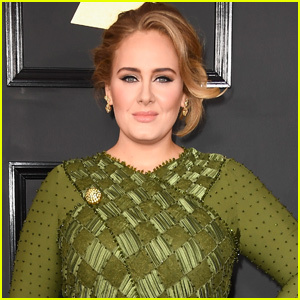 FYI: Ali is wearing Graziela Gems earrings and rings by Graziela Gems, Effy Jewelry, and Vita Fede.